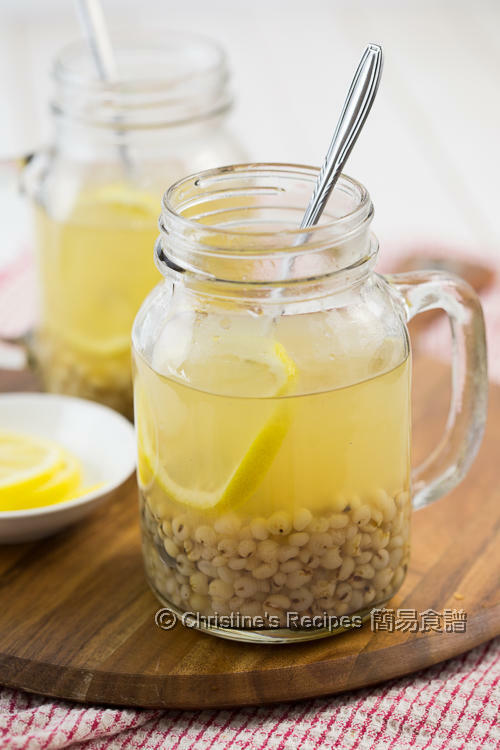 This lemon Job’s tears tea is both appetizing and refreshing. I love its lemony aroma and mild natural sweetness, helping to lift up my spirit. Job’s tears are traditionally used for ages in Chinese home cooking. It becomes a rising healthy star in the recent food scene. Not only it can help to improve indigestion, diarrhea, and trouble urinating, but also lower cholesterol and prevent cancer. More and more western people try to incorporate these tiny grains in drinks, salad or porridge. 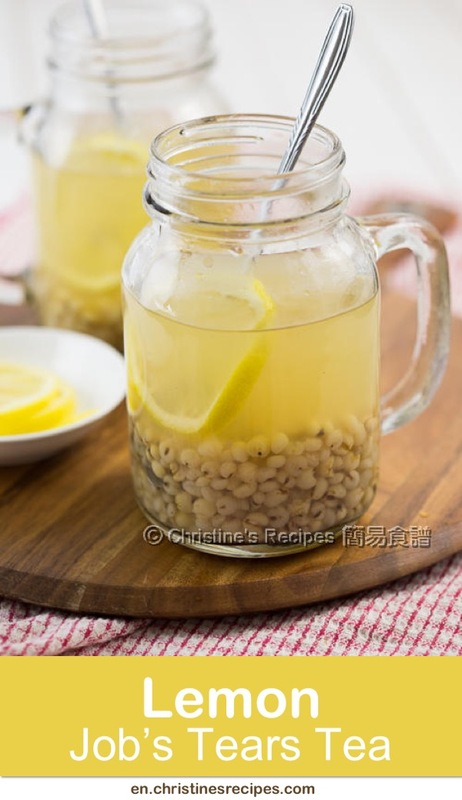 If you’ve lived in Hong Kong or Asia for a while, you would know about Job's tears, or even have tried the popular Job’s tears tea or any desserts made from it. My mother-in-law taught me how to mix in some water cooked with Job’s tears into the milk. It helped to improve our baby’s digestive weakness. 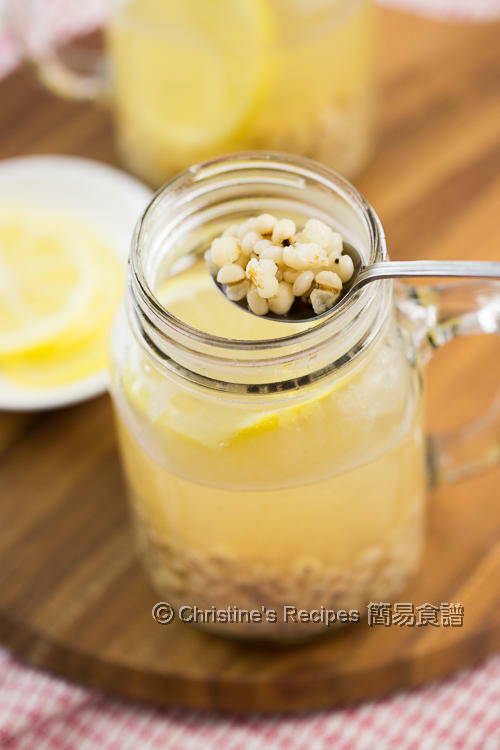 Job’s tears are also known as coix seed, sometimes called Chinese pearl barley. You might see “pearl barley” labelled on some packages out there in the market. Actually, it is not part of the barley family. Bottom: Job's tears. 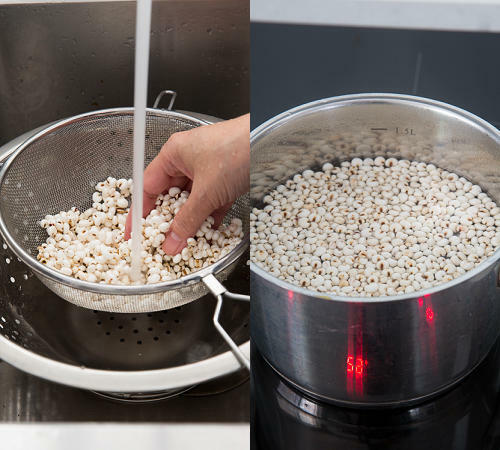 Top: Cooked coix seeds, looked like popcorn. Job’s tears are classified as slightly cold type of foods in traditional Chinese medicine. 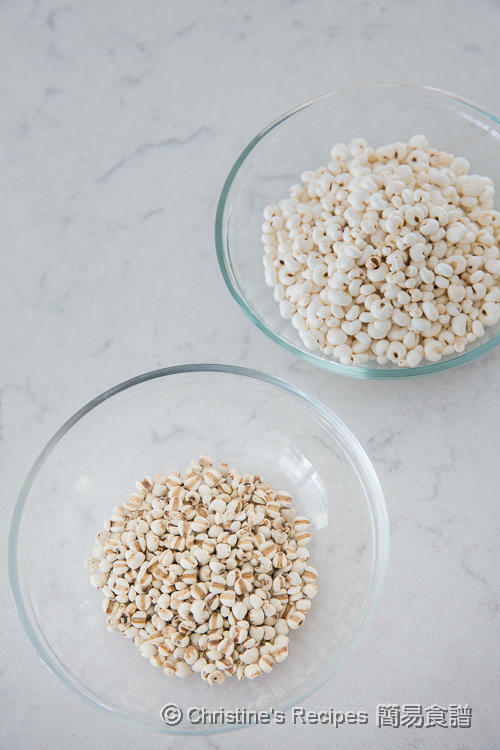 In our home cooking, we often add some cooked ones, looked like popcorn, to maintain the balance for our body. Both raw and cooked ones can be found in Asian grocers. This time I used some candied dates to bring in more natural sweetness. You may add sugar instead for convenience. Or stir in some honey if you like. To make this drink, it’s downright simple. Put all the ingredients into a large pot. Cook until the Job’s tears are softened enough and release all the goodies in the water. Lemon gives you a refreshing feel and brings in pleasant aroma. 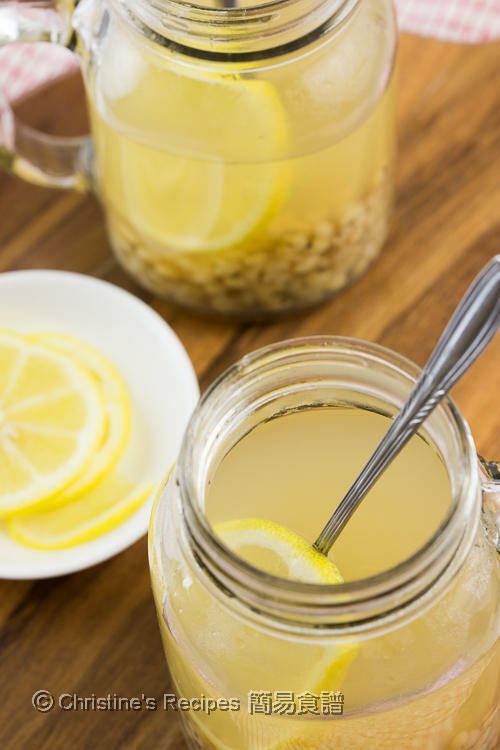 If you want to keep more vitamin C of lemon, make sure not to add it while boiling. Wait until the drink cools down a bit. Well, if you want to enjoy a hot drink, add the lemon whenever you like. The taste is equally good no matter the drink is served hot or cold. Rinse Job’s tears and cooked coix seeds. Drain well. In a deep pot, pour in the water, add Job’s tears, cooked coix seeds and candied dates. Bring it to boil over high heat. Reduce heat to simmer for about 30 to 45 minutes. Turn off the heat. Let it cool down for a while. Add lemon slices and serve. Or chill it in fridge for later use. Then add some lemon slices when serve. It’s better to wait until the water cools down a bit before adding lemon slices. 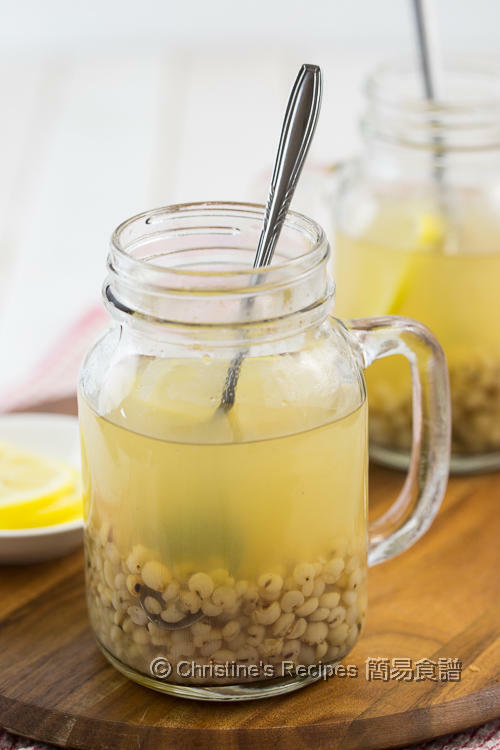 It’ll retain more vitamin C.
From the perspective of traditional Chinese medicine, Job’s tears is of cold type of foods that can help clear body heat and toxins. So we often add some cooked coix seeds to maintain the balance for our body. Candied dates bring in natural sweetness, going so well with the sour taste of lemon. You can replace it with raw sugar if you want. Or stir in some honey instead. Both Job’s tears and cooked coix seeds are available at Asian grocers or Chinese herbal medicine shops. It has been ages since I last had some job's tears. This sounds and looks really tasty and healthy. Thank You!! love to read your wisdom and enjoy chinese medicine in action. Looks refreshing! I just saw Job's tears in the market today and wondered what they were for. Thanks for the great info! Thanks for dropping by. So glad that this post is helpful to you.